On saturday – 30th of July, for the second time this season, we will meet in Madona, where will take place the 4th Pro-Kart, 3rd Latvian Championship and 3rd Latvian Rotax Challenge Cup stages. We remind you that yet until Wednesday (27.07.) 24:00 actively going for participants race. 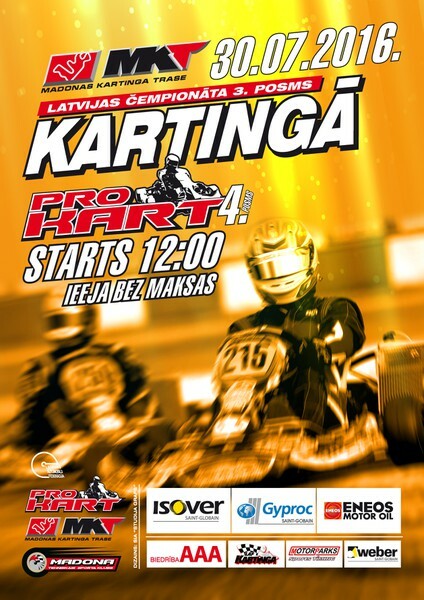 It is, as always, possible to do at www.prokart.lv website, in the "Race". At present, the competition has already signed up 143 racers. As well as, of course, the fact remains that all competition-related provisions can be found in the "Terms". Season is already half and thought that after this stage will already be possible to draw conclusions on recent stages. It should be noted that this time will not happen LMT Autosport Academy stage, but some schools have applied for these competitions. It pleases, because it seems that this project has generated interest in the karting sport as a whole, not only for LMT Autosport Academy mandatory stages. However, there is also a not-so-good news - we have been left a perennial patron, so far, unfortunately, not been able to find another sponsor and fill the resulting "gap" in the budget, should be free organizer is forced to lift the membership fee - in all classes it will be + 10EUR. Organizer apologizes that the news is so sudden and just before the forthcoming stage this week, but until the last moment had hoped that financial difficulties will be solved differently. A little about the agenda. Registration of participants, the technical commission on Saturday, will take place from. 8:00 to 8:30, and parallel from 8:00 to 9:00 will take place in the technical control (to classes). 9:00 will begin free training rides for all classes. Shareholders meeting will be held on 8:30. We remind you that participation in the meeting is mandatory and please not to interfere! Participants stand, as usual, it is already open on Thursday 28.07. from. 8:00. Participants accommodation places are granted only competitors. Places are not pre-booked. Race officials allocate them in the order in which the participants arrive at the spaces. The total estimated duration of the competition 30.07.2016. It is from. 8:00 to 18:00. It is also stressed that participation in the formal awards ceremony is mandatory, not taking into account places won and prizes! We remind you that all the race results online will be found here www.results.lv, in turn, the race will be published www.prokart.lv page under the "Race". As well as throughout the event, participant views and behind the scenes will be possible to follow up on our Facebook page www.facebook.com/Pro-Kart. We remind you that the results of the background, a photo and video of the season 4th event 11.06.2016. www.prokart.lv possible to find the page in the "Race / 2016"
We wish all a successful start and we meet on Saturday – at Madona’s kart track!